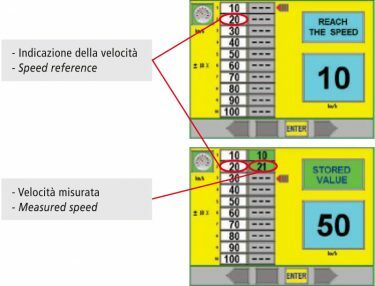 The tester has the function of measuring the actual speed of the vehicle and compare the value shown by the speedometer and the actual value. - a pneumatic system that activates the lifting device. The two pair of rollers are rigidly attached to the special transmission shaft in order to ensure equal speed of both wheels tested in the same axle. The rollers are in neutral position, they do not have braking or inertial load counteracting the axle force of the tested vehicle. The rollers are rectified and balanced to ensure regularity of the test in absence of vibrations. Press the START/F4 key on the remote control to begin the test. 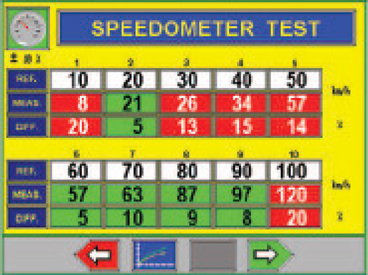 Start the test by gradually increasing the speed until the speed shown on the display and on the odometer reach the first value. Press ENTER/F3 to store the value. The operator can store up to 10 trials. 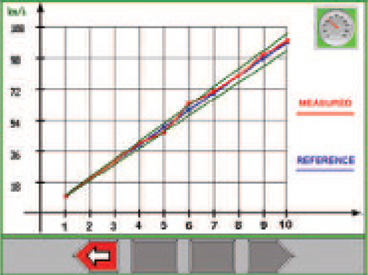 The graph shows the difference between the measured speeds (red graph) compared to the reference speeds (blue graph). The lines represented in green color are the allowable tolerances.